When you need to dig deeper, our earth augers will help you do the job efficiently. They are built to penetrate the ground quickly and are particularly well-suited to tough soils. With convenient controls at your fingertips, you'll have both precision and power. And whether you are taking soil samples, boring plant holes or erecting fences, with our varied accessories you can overcome all kinds of drilling tasks. 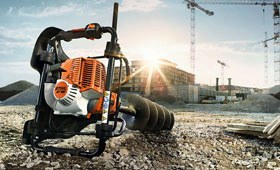 STIHL performance – made for your use.